Chris Marquette plays autistic Duncan perfectly, providing an interesting look at life through his eyes. Much of the film just doesn't come across as believable, and Willis' character is hard to like. 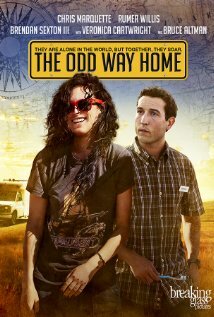 The Odd Way Home stars Rumer Willis (daughter of Bruce Willis and Demi Moore, and most recently of Dancing with the Stars fame) as Maya, a battered woman who has finally decided to leave her abusive boyfriend and make a new start. Unfortunately, that new start doesn’t start off all that well. An overheating vehicle leads to her a remote farmhouse, where she helps herself to whatever she thinks she needs, taking off in an old moving truck that just happens to contain the movie’s other main character – Duncan. Duncan is a higher function autistic man who lives his life by rote. Everything, right down to the basics of bodily function, is done on a strict schedule. Though Duncan often doesn’t understand emotions and social niceties, he seems to take to Maya right from the start, and the two set off together on the most awkward of road trips. Though it’s understandable that pliable Duncan would follow along with Maya’s instructions, for the most part doing as he’s told, Maya’s motivations for staying with Duncan at the beginning of the journey are quite unclear. With Maya being at a point where she seems to care little for things like law and order, the idea that she would feel such empathy for Duncan right from the start just doesn’t come across as believable, and it isn’t the only thing that the movie leaves frustratingly unclear. From mysterious injuries to pills to old friends, there is much that is left a little too much to the imagination, and not being able to figure out exactly what is going on makes it difficult to relate to the characters. Though Willis as Maya just doesn’t make for a relatable or often even believable character, Chris Marquette does a fantastic job as Duncan, really nailing the awkward but lovable man who adores maps but just can’t get the hang of people. Though Maya often seems to just blatantly take advantage of him, Duncan comes across as earnest and loyal almost to a fault, a sweet man who just doesn’t understand the world he lives in. It’s an honest and well done look at autism, often giving a look at what life looks like through Duncan’s eyes. The Odd Way Home is a bit of a quandary. Though it offers some really valuable scenes in they way of seeing life through the eyes of an autistic man, and even through that of a victim of abuse, the overall story just often doesn’t gel, providing viewers with an experience that often comes across as unbelievable and even a bit baffling. It’s an interesting watch in some ways, but just really not a great movie overall.